Kallista had her eighth birthday this month and in honour of it, Phil took the week off work and we all spent some time together. 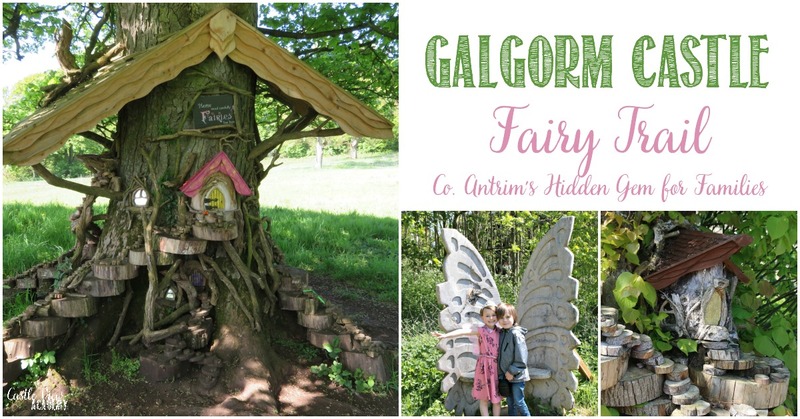 The weather was a little cool and cloudy for Kallista’s big day, but the following day we all clambered into the car and took the hour’s drive through the country to the Galgorm Castle Fairy Trail. 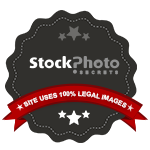 I had been able to purchase a discounted family ticket for just £5, which was a great price. Their usual pricing is £3 for children and £2 for adults. The cost of admission gets you a booklet that gives you clues to follow along the trail to get you to your next location, as well as a couple of fun activities to work on along the way or later at home, where you can then complete the final clues and enter to win a prize on their website. The day was sunny with a slight breeze as we arrived just before noon and settled in at a picnic table at the start of the trail next to the golf course. We enjoyed our Bento lunches, packed with miso-grilled onigiri, sesame chicken, and a mixed salad. The recipes were from A Cook’s Journey To Japan (you can read our review here). Then we started our way along the trail. 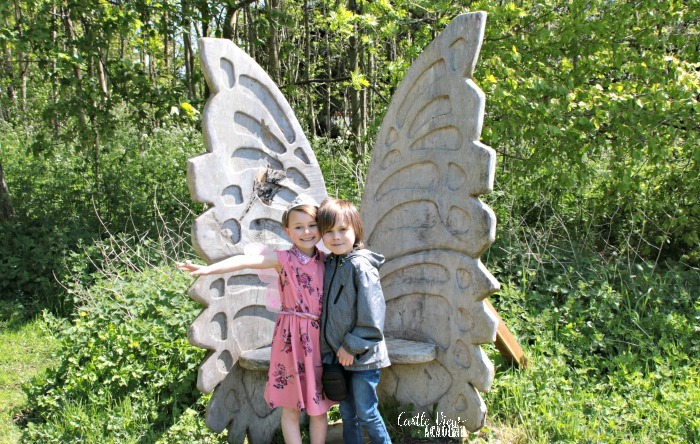 The first stop was at a giant pair of fairy wings. Then we followed the clues and directions along the 12 stops. The trail takes you through the woods, along a stream, past a field, next to the castle, and conveniently back to the garden centre (where we dropped in and Kallista chose a fairy figure to commemorate the day). I won’t walk through the entire trail with you as that would be giving it all away and the mystery would be ruined for you, but I will share a couple of highlights. There were some insects flying about that were a cross between a fly, a mosquito, and a moth – I don’t know what they were, but in some areas there was one or two, and in other areas there were small swarms. This mama may have suggested that they were the fairies of the forest…and then when Kallista saw the next group of them with their wings sparkling with the light of the sun, she had tears of happiness she was so overwhelmed; which were her own words. I have a sarcastic sort of humour at times and I didn’t think she’d actually believe me…but I then couldn’t burst her joy and destroy her magical moment. This is a fairy tree; in Ireland some people really do believe in fairies and if you see a tree standing alone in a field, it is very likely that is a fairy tree and to cut it down would impart bad omens on you. Keep your eyes open, they are actually quite common. At this tree, children shout, “I believe in fairies!” Before walking past the field where the trolls are known to kidnap children…this was too funny because as Tristan was walking he’d been carrying a stick that he was using as a wand all the way through the trail, and all of a sudden it was flung out of his hand and couldn’t be found! Little coincidences like that just added to our day. 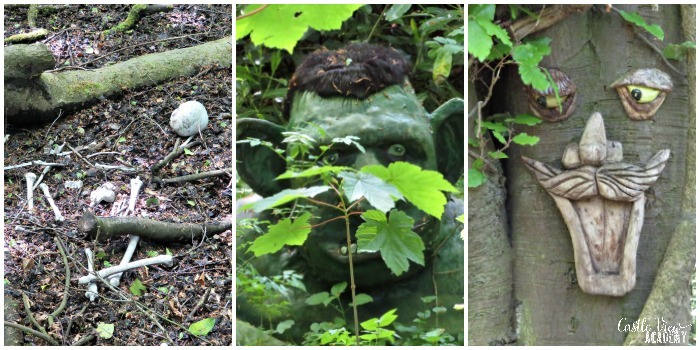 Speaking of trolls, we did spot a couple in the bogs…along with some human-looking bones. This created some fun as the kids have been learning about forensics and they stood and debated about the age of the deceased as well as if they were male or female bones! A home educated family never stops learning!! At the fairy shopping village in amongst the bluebells and trees, a rope was hanging from a big old tree and Phil just couldn’t resist going for a swing on it and showing the kids how he played when he was a kid. 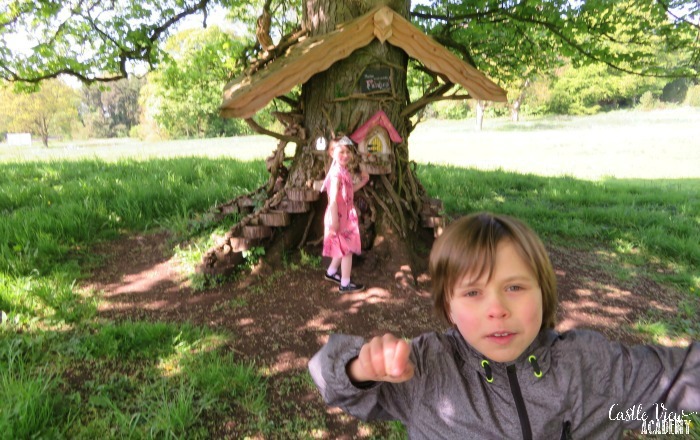 Keep your eyes open as you follow the trail and you will spot fairy houses high in the trees, jars of pixie dust sparkling, and lots of humorous signs as well. We took our time going through the trail, just enjoying the day and our time together. It was mid-week and during the regular school term so we had the trail to ourselves. It took us 4-4.5 hours to complete it (not including our picnic, but we did stop along the way for a snack). For £5 this was indeed a bargain! Even for the regular price of £10, this price is far below most family attractions and isn’t over in in the blink of an eye. The directions, the clues that needed to be solved, and the little details hidden around with care added to the experience. 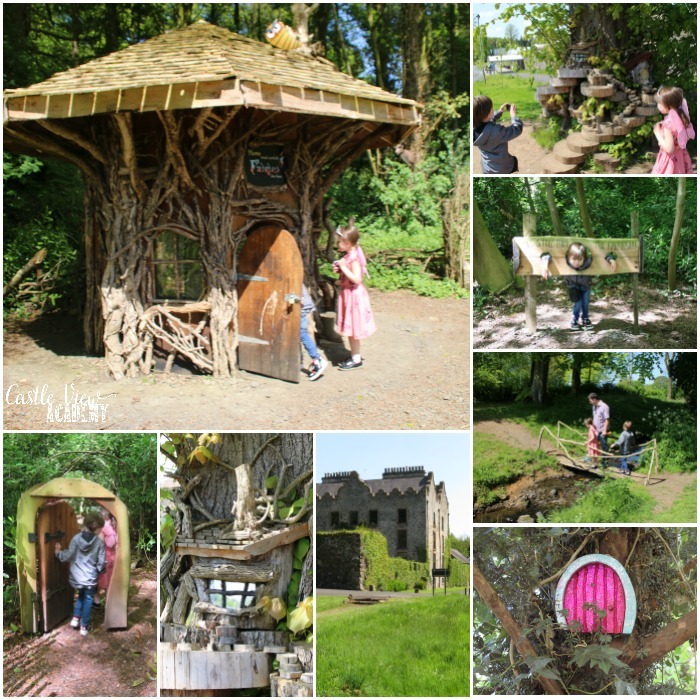 Going up stairs, through mini doorways, making wishes, tiptoeing across bridges so as not to disturb the trolls, kept the children engaged and wondering what the next ‘stop’ might bring. 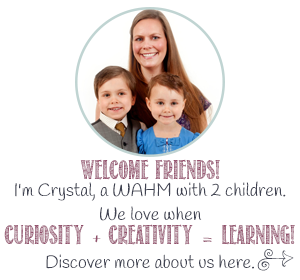 Indeed, I was not disappointed in this experience, and the whole family really enjoyed it. I wouldn’t recommend going on a particularly wet day as you would find it quite muddy and slippery, but it’s perfect for a hot day with the cool shade of the forest. On a dry but gloomy day, the mood would also be good for playing up the role of the trolls. 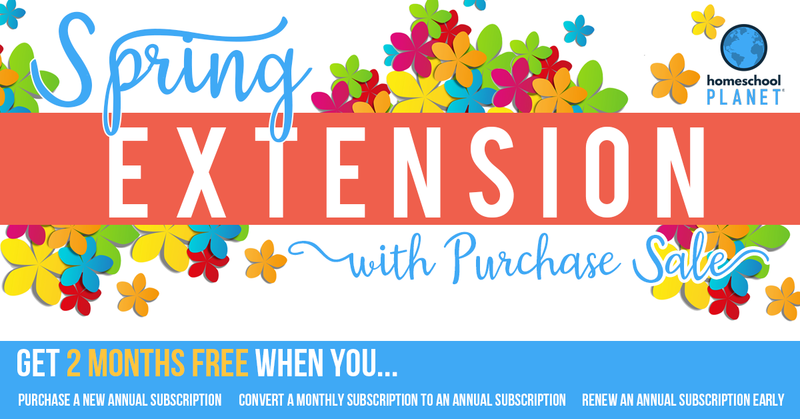 This worked in very well with Kallista’s birthday theme this year, and although she will want to choose something different next year, she is already asking to return again for another family day out filled with adventure. Perhaps then we can do the Environmental Trail or the upcoming Folklore and Friends Trail! 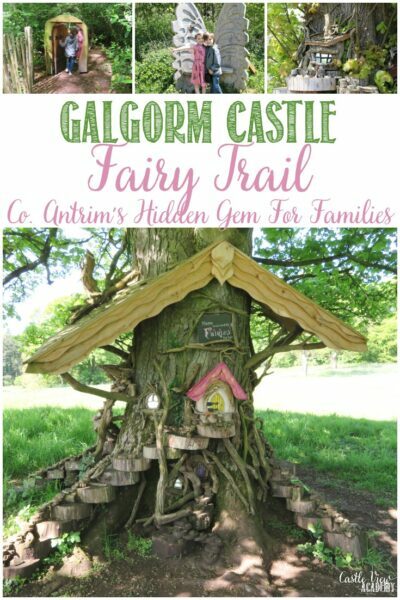 Visit Galgorm Castle Fairy Trail, and follow them on Facebook, Twitter, and Instagram, too. Oh – I so want to come visit this place. My girls would adore it, especially my youngest who is 9. Thanks for sharing and adding some smiles to my day. Happy birthday to your young one. I’ve been disappointed in the past with some of the family activities here compared to Canada, but this time it was a great day out and both of my children loved it!